The Wall Street Journal recently reported that inflation in the United States has declined to its lowest level in 44 years, as measured by the core consumer price index (i.e., excluding food and energy). A prior post here at The REF made a similar observation several months ago. Why does it matter? CPI data provide a backdrop for making informed decisions about whether to buy or sell real estate. In times of inflation, people flee their devaluing cash for hard assets like real estate and commodities. There are other ways for real estate prices to rise — like when interest rates are slashed and lending standards are abandoned. (Sound familiar?) But we will not return to the days of NINJA (no income, job or assets) loans again. So the next real estate boom is far more likely to be fueled by inflation than easy credit. The 1970s are a classic example of inflation-based gains in home prices. Throughout that inflationary decade, real estate values rose in tandem with wages and general CPI inflation. But this is not the 1970s, and the current lack of general CPI and wage inflation takes the pressure off your decision whether to buy a home. Recognize, however, that inflation is not gone. Rather, inflation in some items is being offset by deflation in other items — principally shelter. In fact, the shelter component has gone negative for the first time in the history of the data series. The declining shelter component is keeping the overall CPI much lower than it otherwise would be. The shelter component is based on the cost of renting, not buying. But you won’t have sustainable gains in real estate prices as long as rents are falling. As noted here time and again, one of the pathologies of real estate values in Miami and Coral Gables is that the cost of owning far exceeds the cost of renting — well beyond historical norms. Articles like the one in the Wall Street Journal indicate that the fear of deflation has not disappeared, and that the risk of inflation is thought to be muted. As long as that remains true, there will be little pressure to buy real estate. Recognize, however, that others believe the government deliberately understates inflation, and that easy money and government spending will cause inflation to surge in the not-too-distant future. (See., e.g., www.shadowstats.com). See both sides. When the shelter component flips positive, the evidence of deflation could vanish and lead quickly to general inflation. So it will be wise to keep an eye on this canary in the coal mine. 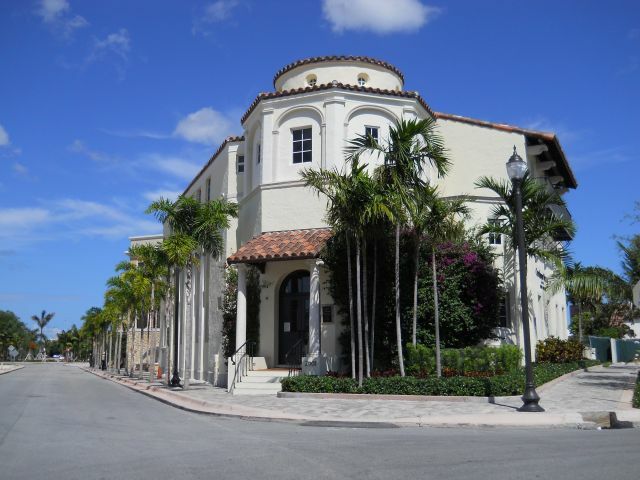 Spanning seven beatifully-planned acres, Old Spanish Village brings the spirit of ancient towns in Andalusia into the vibrant heart of Coral Gables. 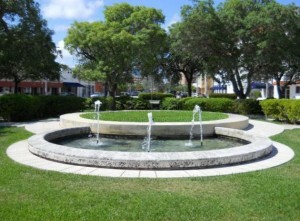 Its cobblestone lanes and plazas, vine-clad pergolas, and splashing fountains create an authentic sense of place. Within this urban village, residents will greet their neighbors across flower-rimmed pocket parks, then stroll beneath shady porticos to the sidewalk cafe or neighborhood bakery whose delicious aromas scent the air. Maybe someday. But for now, the Old Spanish Village development next to Fred B. Hartnett Ponce Circle Park, a few blocks south of Miracle Mile, is bogged down in foreclosure lawsuits. The South Florida Business Journal reported in December that TotalBank brought a $2.4 million claim against two of the developers personally, after they allegedly began missing monthly payments last August. Now, the Journal reports that although the TotalBank suit was settled for partial repayment, a much bigger problem has emerged. FirstBank Puerto Rico has filed a foreclosure suit on the development’s main $42 million mortgage. The bank wants the property. 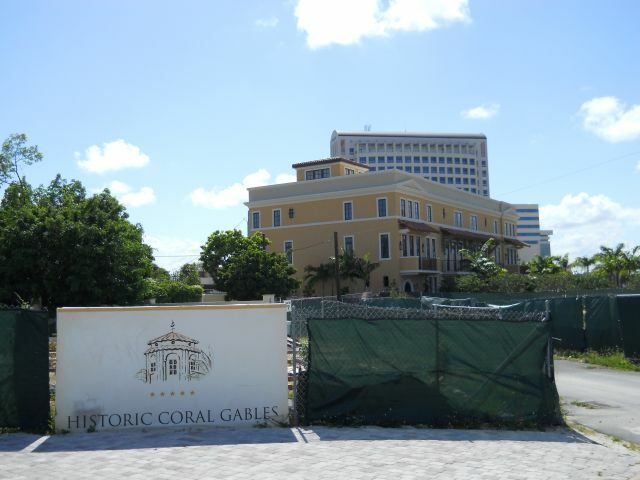 It always seemed a little hard to believe that a luxury real estate development would succeed on the fringe of downtown Coral Gables, with rather underwhelming neighborhoods to the south and east. And breaking ground in 2007 was a bit bold, to put it charitably. At least the promo parties they threw in Ponce Circle Park were fun. 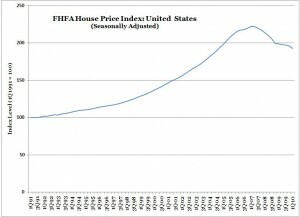 The Federal Housing Finance Agency (FHFA) recently reported its house price index for the first quarter of 2010. Nationally, the index shows price declines re-accelerating after moderating in 2009. In Miami, the index rose a little from the fourth quarter of 2009, but has generally been in a sideways pattern that began abruptly in the second quarter of 2009, breaking the preceding freefall. The sudden sideways pattern is rather unnatural, and may reflect the onslaught of government intervention that became the fashion in spring 2009: $8,000 homebuyer tax credits, suspension of mark-to-market accounting rules, Federal Reserve purchases of securitized mortgages and 10-year Treasury bills, foreclosure prevention programs — the list goes on and on. Indeed, FHFA maintains two price indices: one based on home purchases only, and another based on home purchases and refinance appraisals. 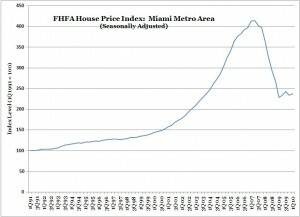 The latter price index posted a notable decline for Miami real estate values in the recent FHFA data release. Buying real estate in Miami or Coral Gables remains a risky proposition. Make sure you work with a broker who will act in your best interests, explain the pros and cons, and preferably rebate you a big chunk of change. Hmmm, wonder who that might be . . . .
Fountain at Fred B. Hartnett Ponce Circle Park (in the middle of Ponce de Leon Boulevard, a few blocks south of Miracle Mile / Coral Way). The Florida Association of Realtors reports that existing home sales rose significantly in Florida, up 27% compared to April 2009. But of course, sales and prices are two very different things. The median price statewide was up 1% from April 2009. 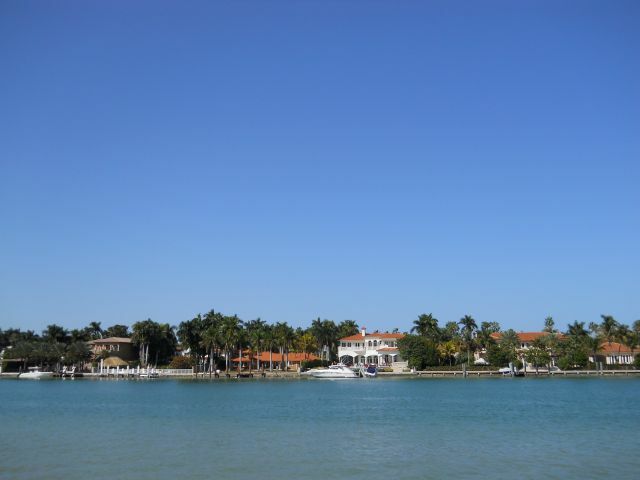 The Miami metro area registered 594 sales at a median price of $192,000 in April — a little soft compared to the 649 sales at a median price of $197,500 in March. Compared to April 2009, when there were 555 sales at a median price of $177,000, the numbers look better. The nationwide picture posted a strong 7.6% gain in sales on a seasonally adjusted basis, and a respectable 4.0% rise in the median price. Like the batting statistics of baseball players who took steroids, the current data deserve an asterisk signifying the possibility that they may be distorted by the $8,000 homebuyer tax credit. Although the credit ended on April 30, that was the deadline for signing contracts. The deadline for closings is June 30. So expect two more months of possibly puffed-up existing home sales numbers before the effects of that particular elixir wear off. What then? Sales and property values could take a hit, but median prices might fare well as the mix of homes shifts upward from the cheaper homes where the credit had the most kick. Miami Heat star Dwyane Wade and his wife sold their 9,035-sf home at 9330 SW 59 Place for $2.5 million, according to public records. 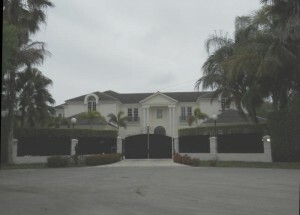 They paid $3.975 million for the house in July 2005, and supposedly put a couple of million into renovations. At $276.70 per square foot, it’s one of the cheapest sales of luxury properties in North Pinecrest since the boom went bust. The ailing real estate market, widely reported marital problems and the cushion of a pro sports star’s salary probably all contributed to the Wades’ decision to unload this property at a substantial discount to their investment. Homebuilders in the U.S. continue to become more optimistic. The Housing Market Index maintained by the National Association of Homebuilders rose to a level of 22 in May from a reading of 19 in April, quite a good improvement in one month. The index is a gauge of homebuilder sentiment. The current level is low by historical standards but has been steadily improving. 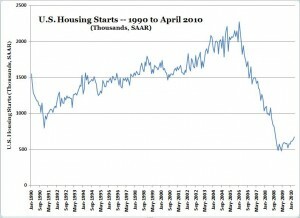 And those homebuilders continue to increase the pace at which they are breaking ground on new homes. Housing starts nationwide rose to a seasonally adjusted annual rate (SAAR) of 672,000 in April, up smartly from a revised 635,000 in March. Evidence of a bottom in housing nationwide continues to mount. But be careful about forcing the nationwide picture into your local frame of reference. Here in Miami and Coral Gables, real estate sales have recovered but prices continue to face headwinds from fundamentals (incomes, rents, employment and historical trendline values). 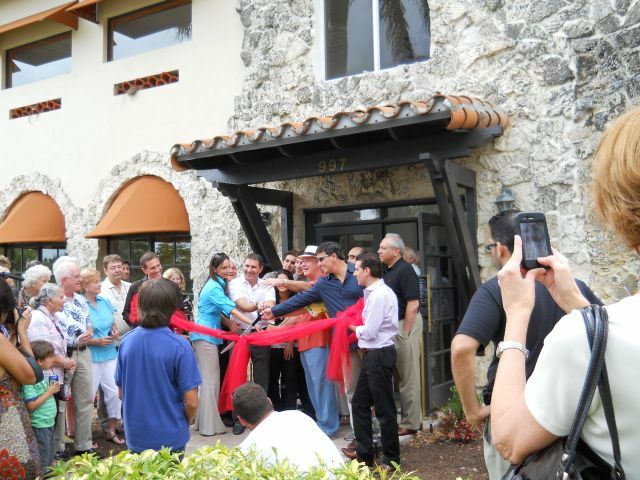 The latest operation at the city-owned Country Club of Coral Gables property officially opened this weekend with a ribbon cutting at the new Liberty Caffe on North Greenway Drive at Granada Boulevard. Additional club operations will open in several phases. The pool and gym, which will require purchase of a membership, should be open in the next few weeks. The restaurant, which will be open to the public, is supposed to open in the next couple of months. And the event facilities are expected to begin operation in about six months. 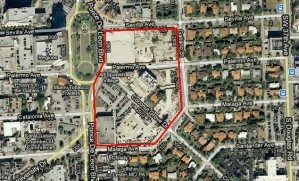 Area residents have expressed concern about the effect that the cafe will have on the character of the neighborhood. The cafe itself is not terribly conspicuous and hardly seems a threat to property values. 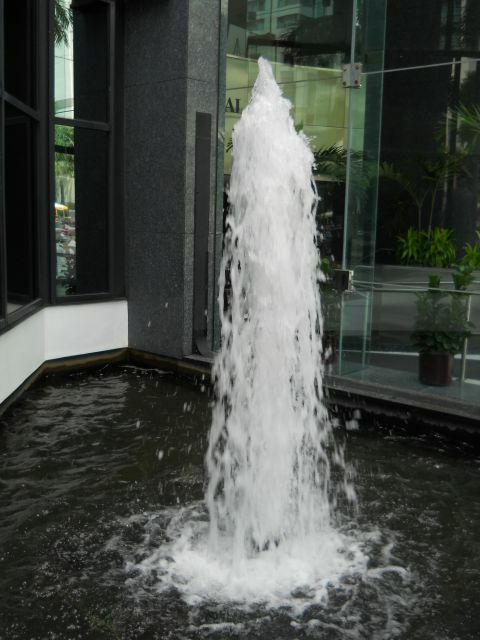 But nearby real estate could be adversely affected if the cafe becomes a popular place to grab a quick cup of cappucino to go. Nobody wants a constant stream of cars zipping up the street, parking and pulling away two minutes later. Is there any reason to think that people around the world are about to flock to Miami and Coral Gables to buy real estate? Not if Google Trends is any indication. The boom has busted. The dream is over. And as with most dreams, we almost surely will not experience it again as long as we live. Fountain at Colonial Bank Building, 1200 Brickell Avenue, Miami.